Carmel Interfaith Alliance, under the leadership of Rev. Jerry Zehr, opened the annual "Meet your Neighbor" series with a very insightful presentation about the Jewish faith offered by one of Indiana's respected and brilliant interfaith leaders, Rabbi Dennis Sasso, at the Carmel City Hall. 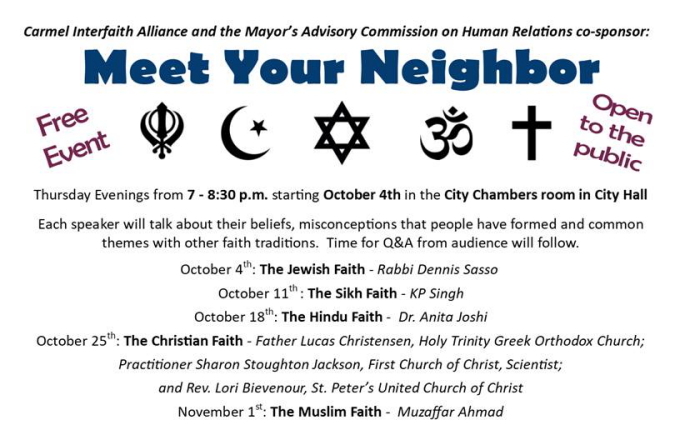 Next week (October 11 at 7:00PM), I would have the honor to share a perspective about the Sikh faith tradition, culture and community. Saturday, October 6th, began with a visit with a group of MBA students from many countries at Butler University and a presentation about the changing, interconnected, and intensely competitive world; the importance of learning about the cultures, people, laws and traditions in place that they will be facing; and tapping into the vision of "Center for Faith and Vocation" at Butler University to succeed in a far different, very challenging and multicultural environment. The presentation drew heavily on my childhood experiences, Sikh faith and traditions, and special challenges since 9/11 as a Sikh American. A few miles from Butler University, in the heart of Downtown Indianapolis, the Fourth Annual Sikh Parade with Sikh and Sheriff's Deputies Motor Cycle riders, a colorful float carrying the Sikh Holy Scriptures and Ragis (religious singers); Gatka (martial arts) demonstrations and a float with singing bards that ended at Veterans Memorial Plaza. Fellowship and the traditional Langar (vegetarian food) for several hundred was served; some joined from other states. 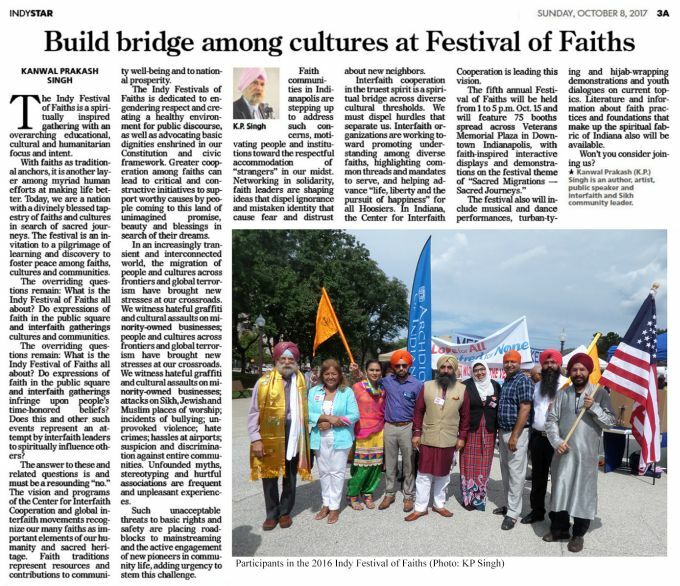 On Sunday, October 14 (11:00 AM - 5:00 PM) at Veterans Memorial Plaza, the place will be humming with the sixth annual Indy Festival of Faiths, a signature event of the Center for Interfaith Cooperation, with a Parade of faith leaders, cultural and informational booths, commercial booths, and ethnic food trucks. 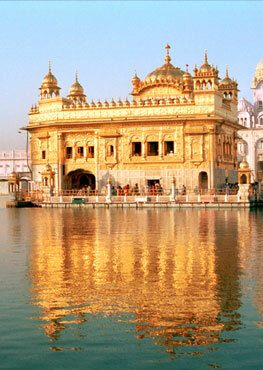 There will be fabulous presentations of diverse sacred arts including a Sikh hymn by Ragis (religious singers) from the main stage, Youth Discussions on current topics and other faith-inspired ideas on the Festival theme of "Compassion in Action;" and opportunity for learning, sharing, and making new friends. 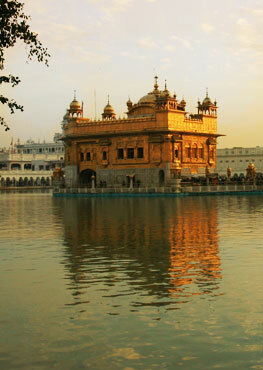 Each year, the Sikh Educational and Cultural Society has played a major role in the Festival. These and so many other events each week are affirming that Indianapolis is emerging as a cultural capital in America's Heartland and Indiana is in the midst of a business, research, educational, and cultural renaissance to secure a proud place in the decades ahead. ~ KP Singh (KPSinghDesigns.com) - Indianapolis, Indiana USA - October 7, 2018.